Lessons and Legacies: The Meaning of the Holocaust in a Changing World, edited by Peter Hayes (Northwestern University) and published in 1991, contains essays by Raul Hilberg, Saul Friedländer, Yehuda Bauer, Steven Katz, Berel Lang, Michael Marrus, David Vital, Hans Mommsen, Claudia Koonz, Robert Gellately, Christopher Browning, Nechama Tec, Lawrence Langer, Alvin Rosenfeld, James Young, Franklin Littell, a group of Holocaust Educational Foundation Volunteers, and Geoffrey Hartman. The volume won the Anisfield-Wolf Book Award in 1992 for its outstanding contribution to the literature on cultural diversity and prejudice. Lessons and Legacies II: Teaching the Holocaust, edited by Donald Schilling (Denison University) and published in 1998, contains essays by Michael Marrus, Gerhard Weinberg, Christopher Browning, Allan Fenigstein, Dina Porat, Judith Baumel, Dan Laor, Lawrence Baron, Judith Donason, Marshall Lee and Michael Steele, and Reuven Hammer. Lessons and Legacies III: Memory, Memorialization, and Denial, edited by Peter Hayes (Northwestern University) and published in 1999, contains essays by Elie Wiesel, Christopher Browning, Alan Steinweis, Gerald Markle, John Roth, Jeffrey Peck, Michael Berkowitz, Karl Schleunes, the editor, Henry Mason, Debórah Dwork, Harold Marcuse, Michael Marrus, Nathan Cogan, Scott Denham, Judith Doneson, Lawrence Baron, Jonathan Petropoulos, and Geoffrey Giles. Lessons and Legacies IV: Reflections on Religion, Justice, Sexuality, and Genocide, edited by Larry Thompson (U.S. Naval Academy) and Marshall Lee (Pacific University) and published in 2003, contains essays by Lawrence Langer, Robert Melson, Doris Bergen, Michael Phayer, Robert Krieg, Ruth Bettina Bern, Randolph Braham, Piotr Wrobel, Marion Kaplan, Atina Grossman, Tomasz Kranz, Geoffrey Giles, and Jeffrey Lesser. Lessons and Legacies V: The Holocaust and Justice, edited by Ronald Smelser (University of Utah) and published in 2002, contains essays by Michael Allen, Andrew Azergailis, David Bankier, Omer Bartov, Alan Berger, Peter Black, Vojtech Blodig, Rachel Brenner, Insa Eschebach, Saul Friedlander, Henry Friedlander, Peter Hayes, Hannes Heer, Sara Horowitz, Irene Kacandes, Michael Marrus, Sybil Milton, Robert Paxton, Renee Poznanski, Lynn Rapaport, Alvin Rosenfeld, Donald Schilling, Gitta Sereny, and Terkel Straede. Lessons and Legacies VI: New Currents in Holocaust Research, edited by Jeffry Diefendorf (University of New Hampshire) and published in 2004, contains essays by Ian Buruma, Paul Jaskot, Sybille Steinbacher, Richard Breitman, Yehuda Bauer, Jonathan Goldstein, Yehudi Lindeman, Lenore Weitzman, Patricia von Papen-Bodek, Konrad Jarausch, Devin Pendas, Dan Michman, Gerhard Weinberg, Dariusz Stolla, Christian Gerlach, Susannah Heschel, Jeffrey Herf, Hillary Earl, Rebecca Wittmann, Constantin Goschler, Jonathan Steinberg, Helen Junz, Pieter Lagrou, Suzanne Brown-Fleming, and James Young. Lessons and Legacies VII: The Holocaust in International Perspective, edited by Dagmar Herzog (City University of New York Graduate School) and published in 2006 contains essays by Omer Bartov, Jonathan Petropoulos, Frank Bajohr, Gerard Aalders, Jan T. Gross, Thomas Pegelow, Jurgen Matthaus, Edward B. Westermann, James Waller, Patricia Szobar, Christa Schikorra, Doris L. Bergen, Rochelle G. Saidel, Martin Dean, Rebecca Golbert, Harvey Asher, Jeffrey Herf, Michael Thad Allen, Suzanne Brown-Fleming, Bob Weinberg, Stuart Liebman, Christian Delage, Lawrence Douglas, Piotr Wrobel, Gavriel D. Rosenfeld and Eric D. Weitz. Lessons and Legacies VIII: From Generation to Generation, by Doris L. Bergen (Editor) and Theodore Zev Weiss (Foreword), (Northwestern University Press) and published in 2008. Lessons and Legacies IX: Memory, History, and Responsibility: Reassessments of the Holocaust, Implications for the Future, by John K. Roth, Jonathan Petropoulos, Lynn Rapaport (Northwestern University Press) and published in March 2010. Lessons and Legacies X: Back to the Sources: Reexamining Perpetrators, Victims, and Bystanders, by Sara R. Horowitz, (Northwestern University Press) and published in October 2012. Lessons and Legacies XI: Expanding Perspectives on the Holocaust in a Changing World, by Hilary Earl and Karl Schleunes (Northwestern University Press) and published in 2014. Lessons and Legacies XII: New Directions in Holocaust Research and Education, by Wendy Lower and Lauren Faulkner Rossi (Northwestern University Press) and published in 2016. 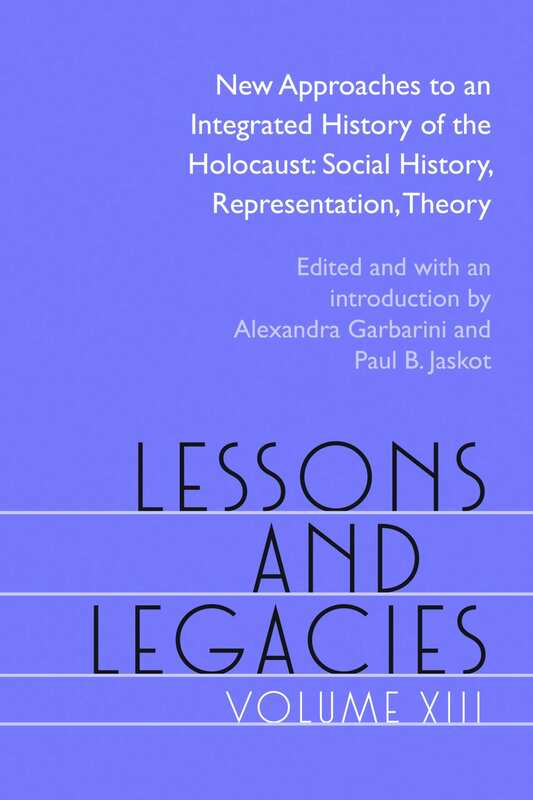 Lessons and Legacies XIII: New Approaches to an Integrated History of the Holocaust: Social History, Representation, Theory, by Alexandra Garbarini and Paul B. Jaskot (Northwestern University Press) and published in 2018.